CMI Structural Solutions offers geotechnical construction and design services throughout the Northeastern United States. Over the last two decades, we’ve established our company as the premier contractor for geotechnical construction. But a lot of people outside of our industry–and some who are in it–aren’t always sure what geotechnical engineering and construction are and how they benefit construction projects. When you are walking down the street, take a look at the buildings around you. Everything is built, literally, from the ground up. The earth beneath the buildings that you see support the structures. Many of these projects started with foundations and floor slabs that weren’t just built on the earth but created with a lot of the same stuff you find in the earth like rock and soil. 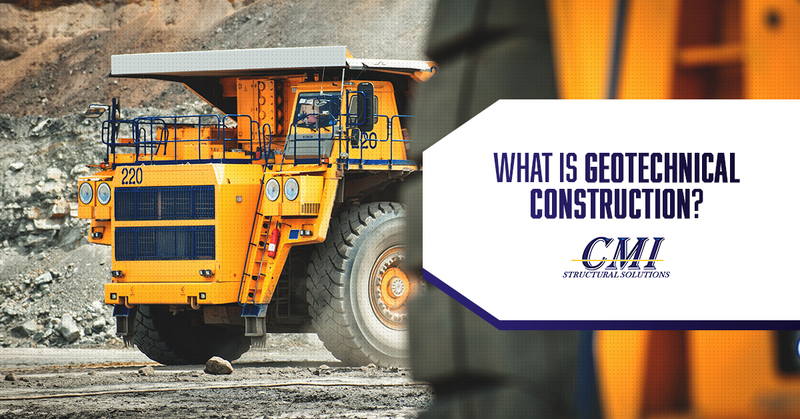 Geotechnical construction is concerned with those foundations of construction: both the actual ground that the project is sitting on and the foundations and supports that are working with the earth to hold the structure up. Geotechnical engineers look at the unique makeup of the earth at the construction site and determine how it’s going to react. Soil composition is different from place to place; it can even vary from one house and the one next to it. The soil is usually some kind of combination of silt, clay, rock, and sand. Different combinations are going to react differently to structures being placed in it. Some might cause more settling and need more reinforcement, while others might be harder to dig into deeply enough to place supports. A geotechnical engineer will be able to determine what’s needed to make the project and the earth work together successfully, while a geotechnical construction team can put those needed structures in place. Our team starts by reviewing your proposed project and identifying the components that could be impacted by the earth. We then complete an analysis of the soil at the proposed site and identify potential challenges. Next, we design foundations and supports that will work with the composition of the earth and support your project. Our team then implements the structures so you can move onto the next phase of your project. Mitigates risks associated with soil movement and shifting. Soil movement, shifting, and settling are more than an inconvenience to a construction site; they can cause major harm to both the people on the site now and those using the building in the future. By understanding the soil and its unique makeup and likely behavior, engineers can take those factors into account and ensure that the building is stable during the construction as well as far into the future. Prepares the site for appropriate drainage and stormwater maintenance. Water has a huge impact on the earth. Afterall, the Grand Canyon was carved by rushing waters moving through the area over millions of years. That’s happening all the time on a much smaller scale in the earth underneath our buildings. It’s down to proper drainage and water management to prevent the earth from being washed out from underneath our buildings. 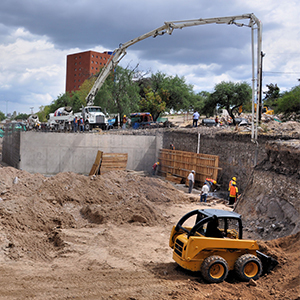 Geotechnical engineering will provide insight into the needed water management. Protects the structure from any future natural phenomenon. Whether it’s blizzards, hurricanes, tornadoes, or earthquakes, there is a lot of natural phenomena that can impact the buildings we use and the ground upon which they stand. Geotechnical engineering looks at how a building could be impacted by likely scenarios and attempts to protect them from damage and total collapse with the right structural support from the ground up. Prevents collapse, leaning, or other structural faults. Have you ever seen a picture of the Leaning Tower of Pisa? That is a construction project that could have used a geotechnical engineer. The tower is leaning because the soil underneath is composed of soft clay. The weight of the tower caused the soil underneath to shift out of place and the entire structure to lean. If a geotechnical engineer had been on site in 1173, they would have been able to analyze the soil and recommend the right foundation and structures that would account for the soft soil and keep the building upright. Saves the construction project time and money. Sites that don’t have the right geotechnical engineering and analysis done are prone to major issues. These issues require the job to stop and expensive corrections to be made. That slows down the project and quickly drives it over budget. If they aren’t done, then there could be even more severe problems in the future which could result in expensive litigation for the construction company. It’s best to invest in the right geotechnical construction from the beginning and ensure the project is a success from start to finish. Are you looking for geotechnical construction help for your construction site? CMI Structural Solutions can help. Get in touch with our team to learn more about our services and how we can assist with your next project. You can reach us by giving us a call or filling out the contact form on our website. We’ll get back to you right away to learn more and then supply you with a bid. Get the help you need to make sure your construction project is a success!